A visitor winds her way off interstate roads to reach artist Beverly Erschell’s home, tucked away in a house overlooking the Ohio River in Northern Kentucky. There, Erschell, 79, paints in a home studio. “All my paintings are discoveries,” she said. “I paint to learn.” Her preferred medium is oils, but she has also worked in transparent watercolor and acrylics. “Painting has no purpose other than to transport a person from one world to another. I’m not making a political or moral statement in my painting,” Erschell commented. At an early age, she discovered art. Attending Miss Doherty’s (now part of Seven Hills School) for seventh and eighth grades, she wanted to go to a coed high school and graduated from Highland Heights High School in Kentucky. “There, the only thing I did well was art. I’ve always been an artist. It was a punishment to read,” she said. By 17 she enrolled in Stephens College in Missouri to study fine art. After she received her associate’s degree from that college, she obtained her bachelor of fine arts in 1969 and master of fine arts in 1971 from the Design, Art and Architecture College of University of Cincinnati. This training she put immediately to use by teaching part-time at the Art Academy of Cincinnati, Northern Kentucky University and UC. Her subjects included art history, painting, art appreciation and drawing. Inspired by such teachers as UC professor Martin Tucker, who taught painting with an emphasis on self-expression, and local artist Robert Fabe, who taught tempura at UC, she also found ideas in her trips to Europe as well as from scenes of Cincinnati. Arthur Louis Helwig (1899 – 1976), instructor at the Art Academy of Cincinnati, gave her a background in painting, particularly value, i.e., an element of art which refers to the lightness or darkness of color. Erschell said a sense of drama in a painting can be intensified by more contrasting values. Academic life wasn’t for her she decided at an early age and after a bout with cancer, treated successfully. She rented a studio in Newport in the early 1970’s and began her professional life. In 1971, Erschell took a picture to Miller Gallery on Hyde Park Square. She sold it in a week. Thus began a partnership of over 30 years. Other galleries where she exhibited include the Rosenbaum Contemporary Gallery run by director Armand Bolling in Boca Raton, Florida and the Marin-Price Gallery headed by Francisco Marin-Price in Chevy Chase, Maryland. Closer to home, she showed at the Malton Gallery on Edwards Road. Later, she began exhibiting her pieces in regional juried art shows at such national recognized art museums as the Contemporary Arts Center and The Dayton Art Institute. Dianneand her now deceased husband Jay Dunkelman donated one of Erschell’s painting to the permanent collection of the Cincinnati Art Museum, which began Erschell’s association with the museum. After the contribution, Erschell attended CAM sales, got to know the CAM staff and eventually brought in prints, cards and ornaments to sell at the gift shop. Nationally known, she has also exhibited in New York City and Dallas, Texas. Her work is represented in private and corporate collections including Procter & Gamble, Cincinnati Financial, Frisch’s and Cincinnati Bell. Eisele Gallery of Fine Art represents her in Cincinnati with eight pieces currently shown there. Selling over 1,000 paintings in her career, Erschell also has cards and prints for sale at the Cincinnati Museum Center and Fabulous Frames on Fourth St.
Now returning artistically to interiors from Cincinnati scenes, Erschell is rejuvenated by watching Alfred Hitchcock movies, which take her to the realm of tension, mystery and suspense. Currently, she has on her easel a challenging, commissioned piece of the ocean in North Carolina. In addition, she wrote and illustrated “The Lucky Greyhound,” a story of her dog, Maple, in 2013. “Modern artists who have influenced my work include David Hockney and Marsden Hartley,” said Erschell. British artist Hockney (1937-1963) who painted using vibrant colors, became an influential force in the 20th century. “I liked the way Hockney has the figures and negative space,” she said. American painter Hartley (1877-1943) influenced her with his clear lines and undecorated style. Her work is often brightly colored, reminding the viewer of Henri Matisse, a French artist (1869 – 1954). When she is stymied artistically, she goes to the masters. In Matisse, she finds bright color and dramatic composition. Additionally, Erschell looked at Impressionist and post-Impressionist works in particular. Van Gogh and Gauguin are obvious influences, while Matisse’s spaces are key influence on her interiors. Her work with interiors inside a room with a balcony on the outside are a reflection of Matisse in the 1930’s. 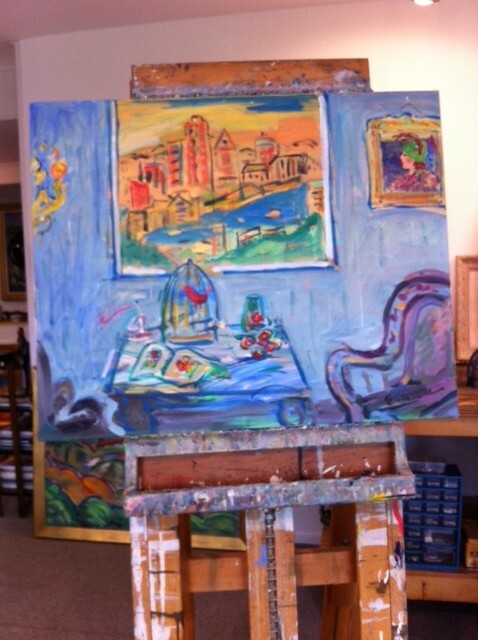 Some oil paintings take months to develop. Two recent unreleased paintings accompany this article. One is “The View of Cincinnati from Newport,” which depicts a Cincinnati urbanscape and the other is “I Know Why the Caged Bird Sings” (title taken after the book written by Dr. Maya Angelou in 1970), which captures her interest in interiors. She emphasizes strong color, fluid line and spontaneity. “In Erschell’s work we encounter the liberation of color, the reduction of space and form, a tendency toward abstraction and spontaneous brushwork. She frequently combines landscape, still life and portraiture into a single painting,” said Phillip Long, director emeritus, Taft Museum of Art. “The pictures are all puzzles for me; and I try to solve them,” she said. To return to the community which has embraced her and her work, she established the Beverly Helmbold Scholarship Foundation at the University of Cincinnati. UC officials asked Erschell if she wanted the money to go to students with talent or need. Her reply was talent. The foundation is designed to help graduate students in fine art. She started with $25,000 and adds money to it every year. A worthy student receives $1,000 for tuition each year. “There’s not as much government funding now,” she said. “Some (students) can go to college if there’s an endowment there,” said Erschell. “I did enough teaching to realize the importance of an education. You have to be tough today to go out and deal with the galleries and museums. It’s a tough world out there,” she added. Erschell is married to Fritz, a retired funeral director at Dobbling, Muehlenkamp Erschell with locations in several Northern Kentucky towns. They have two children, Barbara Sweet and Viktoria Grimme, and seven grandchildren. Erschell has built a successful career: one step at a time. I was immediately drawn to Beverly’s art and talent and her warm fun personality is contagious. This artist’s work makes one smile and brings a room to life. 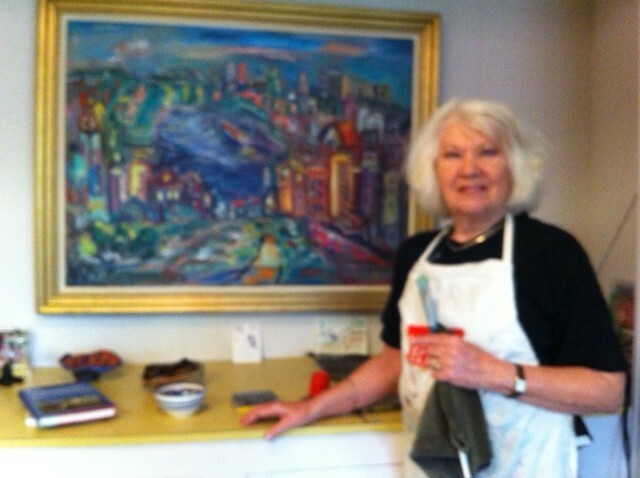 I have Beverly’s art displayed in my home along with her book The Art Of Beverly Erschell. Beverly is a true treasure. An artist that I have had the pleasure to know and love. I fell in love with City Scapes and some of Beverly’s earlier paintings I have always been a fan of hers. Her paintings are beautiful.